Ever since I was very young, I’ve always identified with seagulls. How cool would it be to just be able to flap your wings and go wherever you’d like, whenever? Total freedom. And live at the beach all the time! Definitely appeals! Do I have any brothers and sisters out there? I’m working on a series of small, 9 x 12″ art quilts I hope to finish this weekend. They’ll be hanging together on one wall, all three in a row, and they all feature a seagull. The art quilts are what started me on this drawing/painting journey. 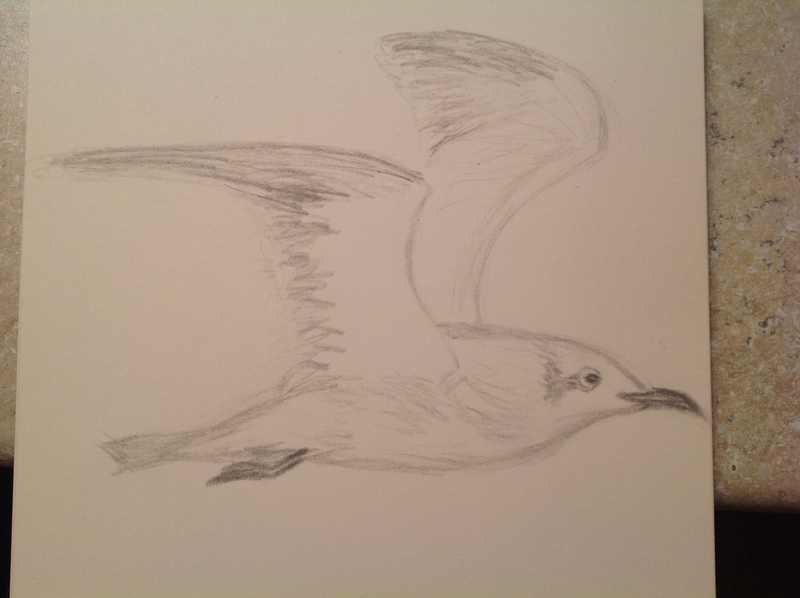 The problem was I couldn’t draw the seagull I knew I wanted to have in all of them! And it was frustrating the crap outta me. The next unclaimed letter is K…..any ideas? More wings coming tomorrow. Dream big, dream fast, and maybe I’ll see you then. Thanks, Paul, that’s a great idea also! I’ve been drawing some dried kiwis which are quite beautiful. A fresh one cut into pieces could be fun too. Wow, also a great one! Woo, I need to ask for suggestions more often. Thank you! Nicely done. Your story reminds me when I was a kid I read “Jonathan Livingston Seagull” and it really captured my interest. I’m pretty sure it was not great literature, but it made me look at Seagulls with fresh eyes. For “K”: how about a Krispy Kreme doughnut? I really want to eat a doughnut right now. I don’t know about JLS being a show. It’s likely. How about Kaleidoscope? That would be a bit of an abstract challenge. Yike, yeah that really would. That’s a really great suggestion, thank you. I am partial to gulls too as I enjoy walking at the beach and watching them soar or dive into the ocean. The quilt sounds like a great idea.